Articles, interviews, and portfolios all about images and the creative process. The premise of LensWork is that photography is more than mere craft. Photography is, or can be, a way of life. Well, magazine isn't quite right, and we've never found the right term to describe our publication. You'll just have to see for yourself! 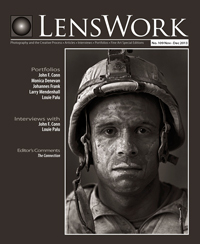 LensWork is a 96-page, 8½x7” paperback periodical — a book-quality, paper-based, anthology-style bimonthly publication. Anthology style, with portfolios like little "books within a book"
Beyond cameras and equipment, beyond film and chemistry, beyond pixels and technology lie the mysteries of the creative life shared by those who strive to communicate and express themselves clearly – fine art photographers, commercial photographers, amateurs and professionals. Just like the finest hardbound fine art books, LensWork is printed in full color and duotone, which has deeper blacks, richer tonality, and can reproduce warm hues that more closely match warm-tone original prints. A magazine without advertising? Really? The entire content of LensWork is a generous helping of insight, wisdom, experience, inspiration, motivation, examples, and a connection to other photographers who are pursuing the creative path like you. LensWork has won the prestigious Benjamin Franklin award (the "Oscar" of the printing industry) an unprecidented five times! Thank you, Hemlock Printing! *Shipping added if you are outside the U.S. Original paper back issues are available from the publisher while supplies last. Are you new to LensWork and would like to have a single issue to review? Our sample pack is $10 and includes . . .